TIFF Bell Lightbox is showing a limited run of 1911, a Chinese war epic that not only acts as the centennial anniversary of the Xinhai Revolution but also the 100th film with Jackie Chan and you can tell he has put quite a bit of effort into this significant milestone. For those not in the know of Chinese history, the Xinhai Revolution is what essentially ended the monarchy in China – specifically the Qing dynasty ruled by the Manchu Clan – and the beginning of the Chinese republic. It’s almost like the Chinese Return of the Jedi – almost. For those who do know the politics of China, this film might come off as a funny product, one that might even be a head scratcher. The irony of a Chinese film that not only glorifies revolution as an act but also the people associated with the act in this particular instance – namely, the ones that would eventually form the KMT – is definitely not lost on me. But politics aside, this film to me is more than that – it is Jackie’s full throttle push into dramatic acting. He has stated on numerous occasions for the last several years now that his age is making it so that he cannot rely on his death-defying stunts as a way to entertain anymore. Audiences should not hold their breath in hopes to see him slide down a tower of blazing hot Christmas lights ten stories high just to fall on a pile of glass or being dragged around Hong Kong by a double decker bus. Even his one-on-one fight scenes are toned down or require multiple cuts to have them flow properly. Add to that his frustration with Hollywood pigeonholing him into a limited range of action star roles, he has been adamant about changing his image. He wants audiences to see him differently, to see that his years as a performer give him more street cred than simply that of a guy who breaks people’s teeth. As much as I understand his reason for such a change, the fact remains that Jackie Chan is more than just an actor even in the loosest sense. He is a brand that will forever be embedded in audiences’ minds in a particular way. A lot of western audiences pretty much only know him as the guy in those Rush Hour movies. You’ve probably seen him in numerous televised interviews where he always state his frustration at people doing funny hand gestures when they see him but they never go “Robert De Niro…” while waving their arms around in pseudo-karate style stances and even then, his explanation of it comes off as humourous. When the guy has built his entire career on Buster Keaton style physical comedy, it’s hard to forget it. 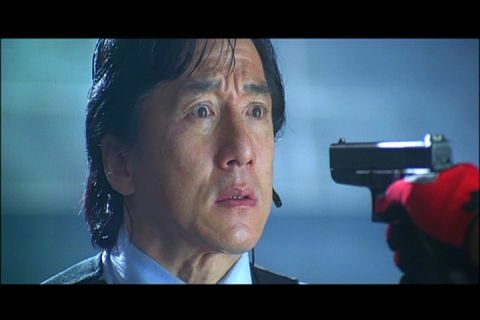 But all of that changed in 2004 when he made a triumphant return to Hong Kong with New Police Story, a modern revamp of one of his most successful franchises (and no, those Twins Effect movies don’t count, regardless of how funny his cameo is). New Police Story is a homage to this installment’s predecessor and a vehicle to show the dramatic and sensitive side of Jackie, blending the type of action from Jackie that audiences haven’t seen in years with characterization that they haven’t seen – at all. While the acting is a hit or miss, when he’s not crying overdramatically and puking his guts out, he does manage to give a glimpse of dramatic weight in his portrayal of a middle-aged cop amongst a slew of Gen-X popstars. The contrast to his typical portrayal of heroic roles continued with The Myth, a tragic love story and adventure drama where he plays the dual role of a Qin dynasty general in a star-crossed love story and his reincarnation as a modern archeologist searching for answers to uncover the story of his past life. He even sings the film’s title love ballad, putting his opera training into good commercial use. Stuff like this will never reach Jackie’s hands in the States and he relishes the opportunity to bite into such a juicy role. However, even after all this when people think Jackie Chan, they still aren’t thinking “dramatic actor” – Jackie Chan wants to be an actor that can do action, not an action star that spews dialogue. So from 2009 onward, he has carefully selected roles that will remove him from this stigma (yet one wonders why he agreed to The Spy Next Door). Most of his films since then started to depend very little on the action and much more on characterization. From playing an illegal immigrant in Shinjuku Incident, an immigrant drama and gang thriller where he does not use a single ounce of martial arts to Little Big Soldier where the action is him throwing rocks, Jackie is embracing his age and dwindling athleticism. However, even then it’s not a hard facade to break for these roles are played by Jackie Chan and not Tony Leung or Lau Ching Wan. He is a larger than life figure and to see him as anything otherwise is hard. The closest he has come to achieving what he’s trying to achieve is in the remake of The Karate Kid where he opts to use subtlety and not overplay a man who is tired, worn out and yes, old. It’s funny how the side that pigeonholes him in the first place is what allows audiences to best connect to him on that level. I guess you have Will Smith to thank for that. On paper, it would seem like 1911 is the next logical step considering how Jet Li won a Hong King Film Award for his role in The Warlords, a period drama tied to actual history with an action star putting on his best dramatic face amongst a crew of dramatic actors like Andy Lau. But somewhere along the way, this logic doesn’t ever jump off of paper. As a project that’s meant to not only be an anniversary celebration of one of the world’s greatest entertainers but also show off Jackie’s versatile dramatic strengths, it simply doesn’t work. Like Andy Lau in the Chinese remake of What Women Want, Jackie is dubbed in the movie despite speaking Mandarin on set. The reason is most likely the same as to why he was dubbed in The Myth, that his voice simply doesn’t sound like that of a Mainlander. It’s interesting to note that his last five Chinese language roles, including The Karate Kid is in Mandarin and not Cantonese. Perhaps he should’ve chosen a Cantonese role as his 100th film milestone if he wanted to showcase his acting skills because the only thing that even resembles acting from him in this film is him posing with his facial hair. It’s a shame too because he doesn’t seem to display the usual overacting here that he does in his other roles. As a celebration film for the Chan Man, I’m disappointed but I certainly hope that sometime in the near future, he can deliver something in his native tongue that rivals and even excels the hype and praise 1911 has received. After all, Hong Kong film is what made him one of the world’s biggest stars.